United Recording & In the Band (FKA SoundArt) Team Up! Last June, Hollywood’s historic studio, United Recording, opened it’s doors to a group of In the Band (FKA Sound Art) students and offered to record one of their original songs. Students were in awe of the massive studio size, professional equipment, and the once-in-a-lifetime opportunity to make their dreams a reality. Thank you so much, United Recording, for collaborating with us to create such an awesome moment for our students. Here is a behind-the-scenes look at the recording session! Ace Shop, owned by the Ace Hotel, collaborates with friends whose work inspires them to provide quality items that support the community. Along with things to wear, you'll find a lovingly curated selection of art, books, vinyl, leather, wood, magic. Many of the things here are carefully crafted by hand— it’s definitely more than just a gift shop. All of them share Ace’s obsession to quality, thoughtfulness and attention to detail. We are proud to collaborate with Ace Shop on a set of pins that will be sold at all of their hotel gift shops and online. One pin to wear your love like heaven. The other, the green, gold and red of the Southland, to be firmly affixed over your heart. Proceeds will be donated to In the Band! As a leader in the community since the program’s inception in 2002, In The Band (formally Sound Art) continues to be the only organization in LA County dedicated to serving at-risk youth with a mobile music education program that is culturally relevant to the experiences of the youth we serve. On August 13, 2016 Sound Art's Boyle Heights band performed at the Rock Day LA event in downtown Los Angeles organized by city councilman José Huizar and the City of Los Angeles’ Bureau of Engineering. In Los Angeles’ ongoing effort to keep the public engaged in this $449 million 6th Street Viaduct Replacement Project and connected to the storied bridge, Councilmember José Huizar and the City of Los Angeles’ Bureau of Engineering hosted Rock Day LA. Attendees were given free pieces of the old viaduct along with Certificates of Authenticity. They also enjoyed food, activities and music played by our very own In the Band students! Attendees also got to see what the new, Michael Maltzan designed, viaduct will look like when it’s completed in 2019. Special thanks to Councilman Huizar's office for inviting the In the Band students to perform. We had a blast! 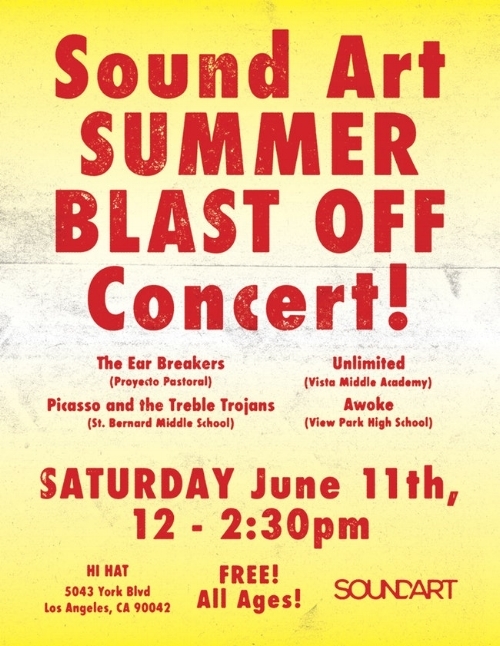 On Saturday, June 11, 2016, we hosted our first annual Sound Art Summer Blast Off Concert featuring all of the groups from our programming this school year at The Hi Hat in Highland Park. Awoke from View Park High School! We had an amazing time enjoying the music our students have worked so hard on to perform for the audience. Keep updated for the next Summer Blast Off Concert!